The first time my husband and I hosted a dinner party for guests as a newly married couple he surprised us all – including me. He would, he declared – ‘make some kehwa’ and ‘would everyone like to try some?’ This kehwa, I would soon find out is a specialty of his, and it is unique enough and interesting enough, especially for guests who are not familiar with it, to actually become a topic of (after dinner) dinner table conversation. 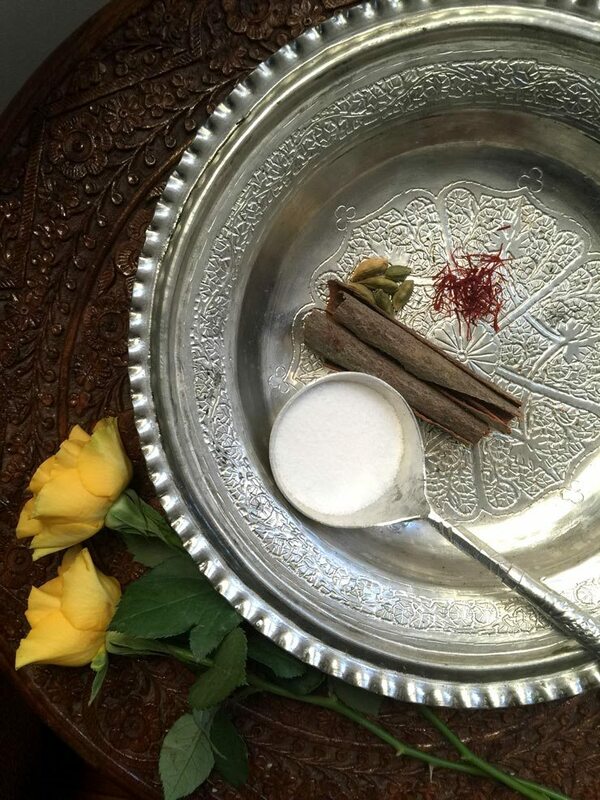 From the samovar to the saffron, this drink is evocative of the beautiful valley of Kashmir. 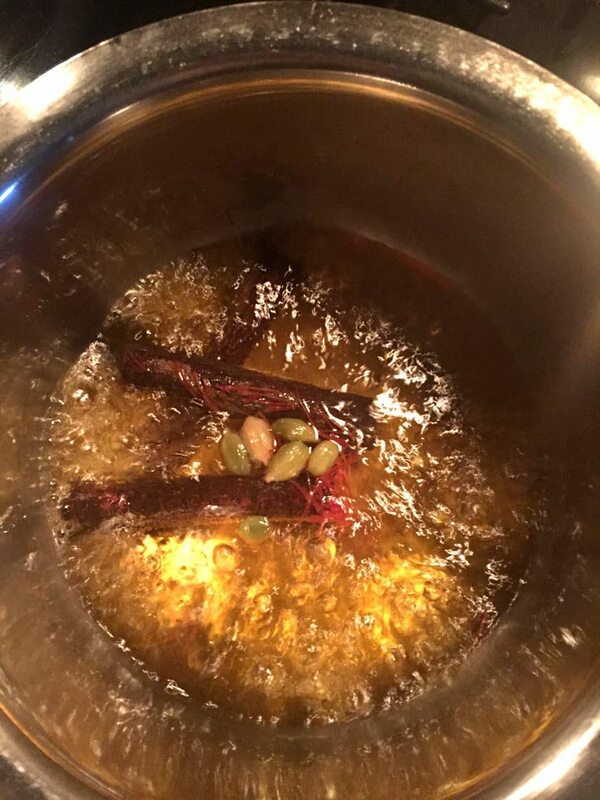 Some of you may be familiar with Kashmiri pink tea (which by the way is actually drunk as a salty beverage by Kashmiris of Indian Occupied Kashmir and not the sugar added one found in most Pakistani restaurants) but not many have had a chance to taste authentic Kashmiri kahwa. Since that first dinner party we have continued to offer kahwa to our guests after dinner, we mostly serve it by itself and never has a single person tried it without offering many compliments in return! 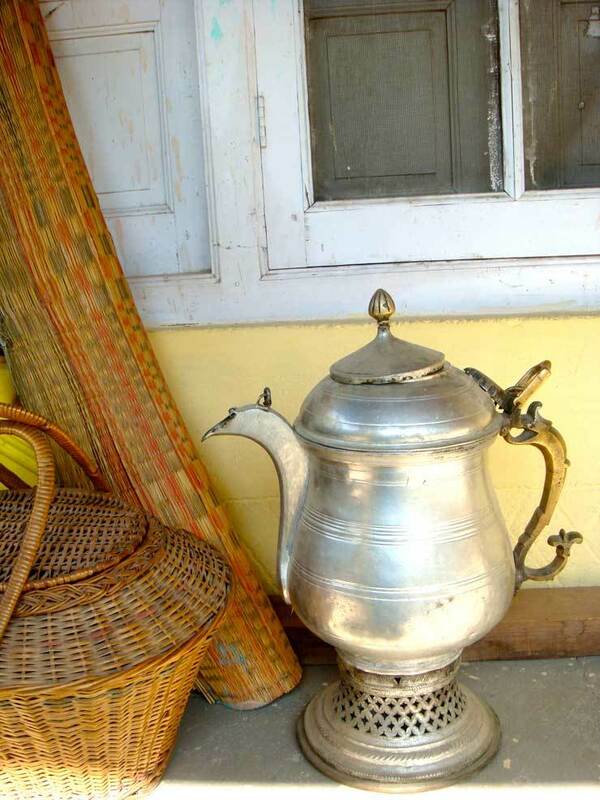 Here is how to brew your own ‘kashur kahwa’ at home if you’d like. I recommend you have company to go with it! 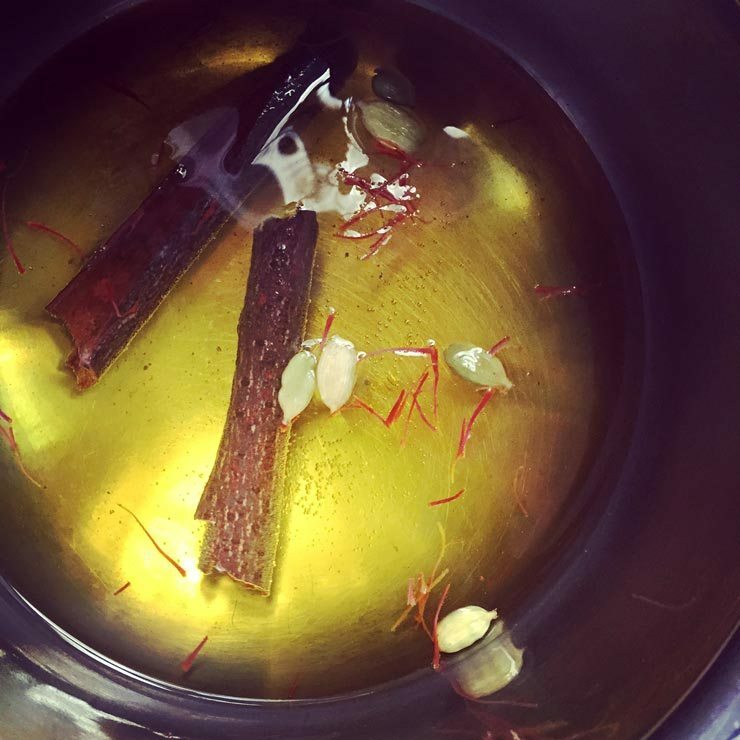 First of all can I tell you that this is not just a recipe for a sweet hot drink, it is also a recipe for the most beautiful home fragrance you can whip up in a few minutes! 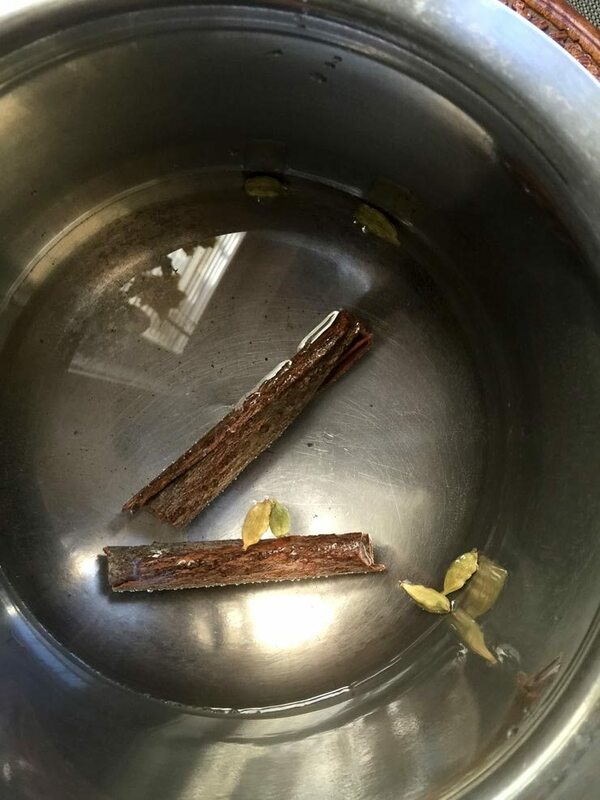 Take one and a half mugs of water pour into pan for boiling, add to the water the cinnamon and cardamom. Once it starts to nearly boil add the saffron and sugar, let it boil well for 3-4 minutes the water will have reduced, but you should notice the colour of the saffron coming through. Add one and a half more mugs of water to the boiling mixture and let it boil – taste for sugar – it should be quite sweet. You can substitute honey for sugar if you like. Let it boil for a few minutes longer and keep on sim. Kahwa is ready! It’s deceivingly simple but the results are beautiful. 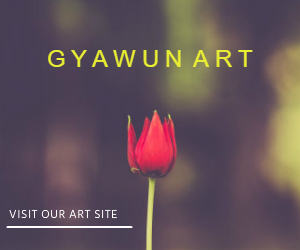 There is no caffeine at all, still the combination is quite refreshing without causing any loss of sleep when bedtime comes around. Even little hands will be happy to grab this drink but make sure it is extra cooled down for them. 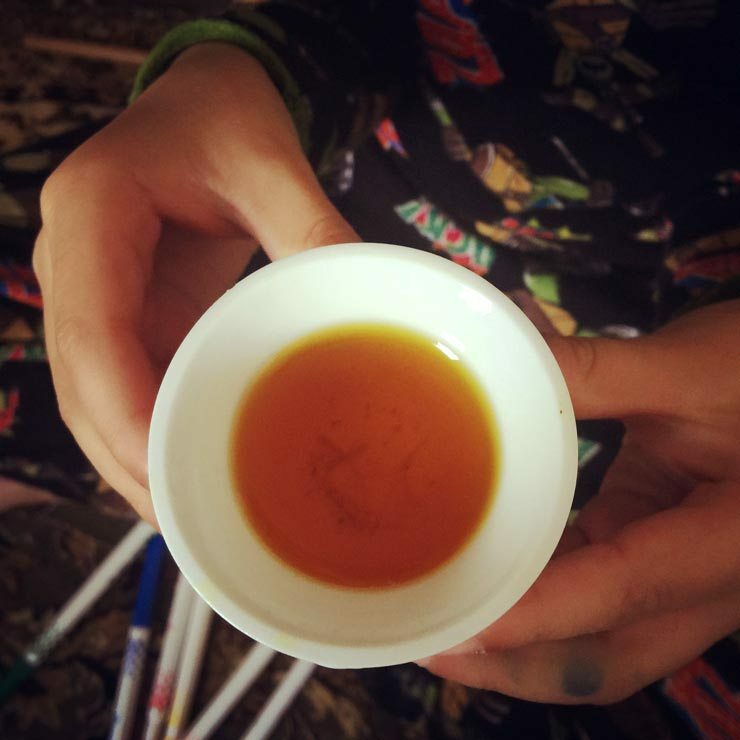 Sometimes people in Kashmir do add a pinch of green tea to it, as saffron is very expensive and not all can come by it. Feel free to add some green tea if you would like to but try it this way first.